Based in Virginia, Tyffani Benard began writing health-related articles in 2010. Her work has appeared in various online publications. Benard has a background in dentistry and science, and enjoys making these complicated subjects accessible to the general public through her writing. She holds a Doctor of Dental Surgery from Howard University and a Bachelor of Science in biology from Florida A&M University. Lasers employ an intense beam of light to permanently remove hair or scars from the body. 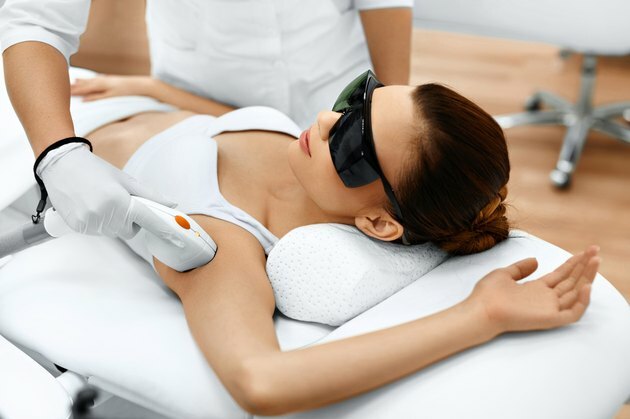 During hair removal the laser pulse enters the hair follicle, where it burns the follicle, preventing hair growth. Lasers are also used to remove some types of scars, revealing a healthy layer of skin underneath. Laser treatment is not appropriate for everyone. It works best on fair-skinned people, and several treatments may be necessary to achieve the desired result. When using lasers on the underarms, practitioners must take special care to avoid potential side effects. Skin irritation is a mild side effect of laser treatment of the armpits. Due to the heat and light from the laser, irritation may occur on the skin after treatment. This can range from slight redness that is reduced within a few hours to the formation of crust or a scab. This should be a temporary manifestation that should resolve itself within a few days. To avoid irritation after treatment, keep the area clean and dry but avoid harsh soaps and deodorants. Avoid shaving the area as long as there is irritation. A laser placed on an improper setting can lead to pigment changes, especially in those with darker skin. Skin can become lighter or darker, but the changes are usually transient. Skin color changes may last from a several weeks to a few months. If pigment changes occur, avoid excessive sun exposure, which will exacerbate the problem. A rare side effect of laser use on the armpits is scarring. This is usually caused by a setting placed higher than necessary, and it occurs more commonly in individuals with darker complexions. When this happens, the skin is burned along with the hair follicle. This can be extremely uncomfortable, especially in the armpit region. Palliative treatment is necessary to relieve discomfort, but contact your practitioner first. Are These 10 No-Knife Beauty Procedures Worth the Risks?